The Thunderbolt interface is a specific type of hardware interface developed by Intel Corporation in collaboration with Apple Inc. This interface is basically an input-output medium for connecting external hardware peripherals and devices to a computer. 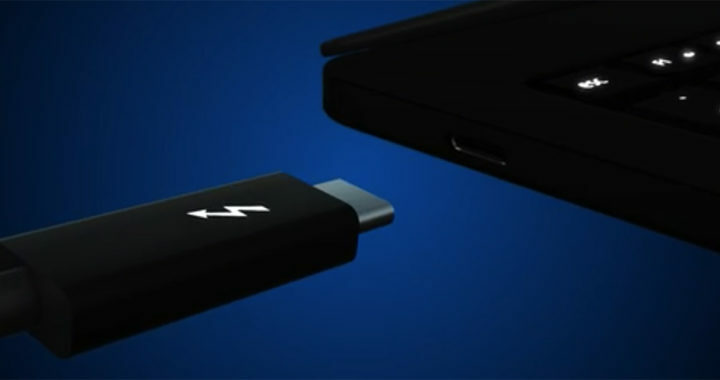 Initially popularized by Apple through its Mac and MacBook lines of computers, the Thunderbolt interface has now been integrated in mid-range to high-end Windows desktop and laptop computers. However, since it was first introduced in 2009 and eventually launched in 2011, the hardware ecosystem that takes advantage of the technology behind Thunderbolt remains very limited a compared to the more popular Universal Serial Bus or USB interface. To understand better what is a Thunderbolt interface and the principles behind its technology, take note of the advantages and disadvantages listed and discussed in this article. 1. Three-in-one technology: The primary selling point of Thunderbolt is that it is an interface that combines PCI Express and DisplayPort into two serial data stream, in addition to DC connection for power. Hence, it can connect and power different power-intensive hardware peripherals such as storage and networking devices, as well as display and audio output and input devices. The primary advantage of Thunderbolt essentially revolves around expanding the capability of a computer while reducing cables and other interface ports. 2. Faster data transfer rates: The first version of the Thunderbolt interface supports a data transfer rate of 10Gbps. The current Thunderbolt 3 supports a transfer rate of up to 40Gbps. This means that Thunderbolt 3 is 8x faster than USB 3.0 and has 4x more video bandwidth than HDMI 1.4. Faster data transfer rates means support for a range of functions. These include multi-streaming HD and 4K UHD video to multiple monitors, as well as faster file transfer, especially for high-definition audio-video files. Other functions include fast charging of devices with 100W system charging and 15W to bus-powered devices, as well as 10Gb Ethernet connection between computers. 3. Graphic-based expansion capability: Hardware manufacturers have been trying to develop graphic expansion peripherals based on the USB interface. However, USB is not really designed for high-performance graphics input-output. One of the advantages of Thunderbolt is that it is a low-latency and high-bandwidth interface that allows connectivity between a computer and an external graphics card unit or eGPU or eGFX. Remember that this is possible because of the integration of PCI Express into the serial data stream. 4. Daisy-chaining: The capabilities of Thunderbolt also translate to daisy-chaining or a wiring scheme that involves connecting multiple devices and hardware peripherals together in a sequence or a ring. Thunderbolt 3 allows daisy-chaining of up to six devices and peripherals. Some examples of daisy-chained schemes are five native Thunderbolt devices and two Thunderbolt-based displays, six devices and one display or via mini-DisplayPort adapter, and five devices connected to a Thunderbolt-based display and a mini-DisplayPort adapter. 5. Support for USB-C: Another notable advantage of the Thunderbolt interface, particularly one of the pros of the latest Thunderbolt 3, centers on the adaption of USB-C or USB Type-C specification standards. The new Thunderbolt 3 now rolls PCI Express, DisplayPort, USB 3.1, and DC power into a single cable. The adaption of USB-C future-proofs computers and external peripherals and devices while also standardizing manufacturing specifications across the industry. 1. Confusion with standard USB: One problem with the Thunderbolt 3 is that it looks similar to other USB cables that support the USB-C standard. Some users might think that all USB-C ports found in their computers support Thunderbolt 3. Others might also think that USB-C cables are akin to Thunderbolt 3 cables. It is important to clear the fact that USB is different from Thunderbolt. Both are hardware interfaces. To be specific, USB is an wide-encompassing term pertaining to an industry standard for defining cables, connectors, and protocols used for interfacing two or more device. USB-C is a USB type that is also different from USB interface. A USB type essentially refers to the physical shape, pin placements, and the wiring of the plugs and ports. On the other hand, USB versions such as USB 1 and USB 3.1 refer to the speed and functionality of the USB interface. Thunderbolt 3 is essentially a type of USB-C with added distinct functionalities. 2. Small product ecosystem: Another disadvantage of the Thunderbolt interface is the relatively small size of the product ecosystem. There are few and not to mention, expensive peripherals and devices manufactured to take advantage of Thunderbolt such as the 12-inch MacBook and MacBook Pro from Apple. The introduction of Thunderbolt 3 further limits the existing product ecosystem. Thus, unlike the standard USB interface or FireWire, it is safe to say that Thunderbolt is not developed and deployed for average or general users. 3. Expensive: Cost is another disadvantage of Thunderbolt. The cable can cost ten times as much as a standard USB cable while computers that support the hardware interface are generally sold under the mid-tier to top-tier price range. There are several reasons for the high price tag attached to Thunderbolt. One is that it involves the use of a propriety technology owned by Intel and Apple. Another reason is price elasticity based on supply and demand. The small product ecosystem affects mass adaption. 4. Security vulnerability: The security of connection and data transmission is another problem of the Thunderbolt interface. Like other high-speed expansion buses such as PCI, FireWire, PC Card, and Express Card, this hardware interface is potentially vulnerable to direct memory access or DMA attacks. DMA attacks center on the principle of attaching an external malicious device to a computer to access the system memory, thus allowing the reading and writing of such, exposing of encryption keys, and installing of different types of malware. Another vulnerability is Option ROM attacks. The Thunderbolt interface can be used to load and execute malicious Option ROMs from attached peripheral or device. Execution can transpire even before the computer runs the operating system, thus allowing kernel invasion, logging of keystrokes, and exposure of encryption keys.